What the hell is Cold Brew? Have you ever asked yourself why coffee doesn’t taste as good as the beans smell? Cold Brew is the answer. Neither bitter nor sour: Cold Brew is smoother, more tasty and even healthier than its well known hot siblings like espresso and filter coffee. For the brewing you only need three things: good water, very good coffee and a lot of patience. We don’t scald the coffee in a brutal shock treatment with hot water. We use a gentle and slow extraction of the natural aromas instead. And in fact, coffee has even more natural aromas than a good red wine! A cold water extraction like this can take up to 24 hours. But it is definitely worth it. 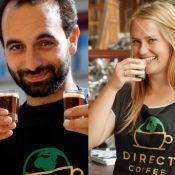 Marie and Michael: We’ve always loved coffee, but we really lost our hearts on our first journey to Ethiopia – our honeymoon. 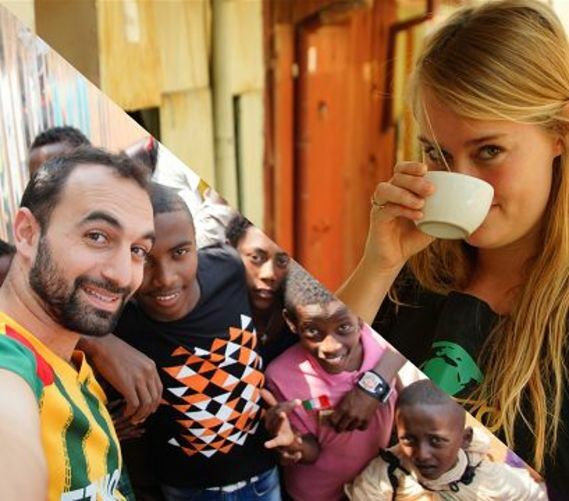 Shortly after coming back, we quit our jobs (Marie was a journalist and Michael an Africa expert) and to found our social startup Direct Coffee. We went back to Ethiopia, found the best coffee in the world and imported it directly from the cooperative to Switzerland. Since then we’re selling coffee. Our new baby is called Cold Brew. Our common passion is to find out where the products we consume on a daily basis come from. That’s why we founded Direct Coffee and why we want to share our insights with you via our website, facebook & blog. As an example: For our coffee beans, we show you in detail what the money will be used for. 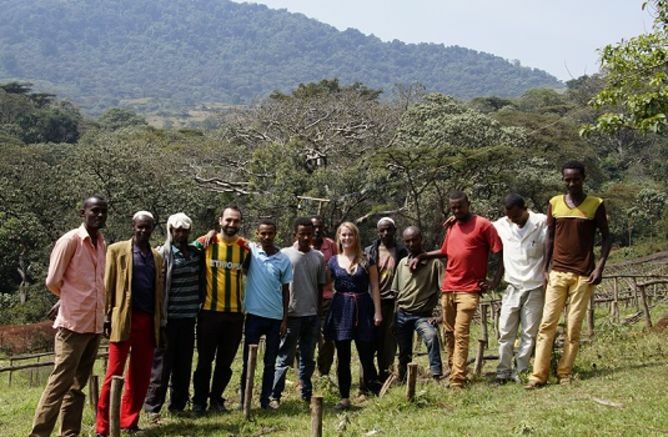 Even though Ethiopia is far away from Switzerland, we want to build a connection between you and the families that grow your coffee. To have an even longer lasting positive effect on the community, you support one child with each bottle with a deworming treatment. That sounds a bit weird, but it is one of the most efficient ways to support development: Because the children can go to school without bellyache. We are looking for Cold Brew pioneers. There are already a lot of them in the US – and we believe that a lot of people in the deep valleys, at the fast rivers and the beautiful lakes of Switzerland are waiting for Cold Brew. With this campaign, you can show that you exist! And we hope that this will make it easy for us to find partners for the distribution. At the moment, we’re brewing the Cold Brew in our kitchen in Kreis 4 in Zurich. But if our dreams come true, our small one-room apartment will soon be too small for the production site. We also need a bit of money to buy all the brewing containers, funnels, filters, bottles and lables, that we need for the first phase of growth. So please support us and share! Last but not least: We want you to enjoy your Cold Brew… Cheers! This project ended successfully on 24/9/2016 15:00! Sounds awesome! But I want to start from the scratch. Please send me a planting set with soil and green coffee seeds from Ethiopia. I plant my own little coffee plantation, wait three years until the coffee trees begin to bear coffee cherries, then harvest the ripe cherries, depulp them, let the beans dry to roast and grind them coarsley – all that to brew my own Cold Brew! Cold brew coffee? I have to taste it! Please send me six bottles à 200ml and I’ll find out how I like it the best: pure, on the rocks, with milk or with Bailesy or Whiskey, with marple sirup or tonic – I will try it all out and tell you my favourite mixes. My Cold Brew can stay for a month in the fridge and will be sent within Switzerland only. Ready made Cold Brew from the bottle? Too easy for me! I want to learn how to brew Cold Brew from you. Even if it takes a while.... The first day, I prepare the brew with you together in your coffee kitchen in Zurich and on the day after, I come back and filter the Cold Brew by hand. Then, we’ll make a tasting! And at the end, I receive a little cold brewing set including the perfect coffee for my own Cold Brew. We organize everything via Doodle and I have the choice between two different dates at the beginning of November. Drink means that we can drink it – so let’s drink together! On the day after the campaign ends (Saturday 24th of September) we make a Party in Zürich and taste all the mixes we can imagine. Me and a friend drink as much as we want and celebrate as long as we stay awake – prepare yourself for a long night warm – as it’s coffee, there is coffein in the Cold Brew. Those who can remember their recipe on the next day can give it to us for publication. I want to spread the word – and the Cold Brew! Send me ten times six bottles à 200ml. One sixer for myself, the rest is for my friends and colleagues. Sharing is caring :) I understand that the Cold Brew will be sent within Switzerland only. Cold Brew is only for summer time? No way! Together, we develop a strategy to make Cold Brew the next big thing for the skying season. Cold Brew, vodka and marple sirup? Not bad, but I’ve got a better idea! I spend one weekend with you in the mountains 1,5 hours from Zurich. If I want to share my room, I can bring a friend along. Accomodation, food and drinks inclusive. I’m planning my own party and the only thing that is missing is: Cold Brew, Cold Brew, Cold Brew! You are coming to the location (somewhere in Switzerland) and spoil my guests with a plenty of cold coffee – no one will sleep before the sun rises again. 75 bottles à 200ml, loads of ice cubes, five bottles of spirit – and good spirits inclusive. I will write you an email upfront for availability to avoid that you’re in Ethiopia at that date. I’ll come with you! I join you on your journey to Ethiopia to meet the coffee farmers and see the coffee plantations with my own eyes. I also support you with the implementation of the social projects. I’m ready to spend between 1.5 and 3 weeks in November 2016 on the trip. You take care of the economy flight, slightly inconvenient accomodation and bumpy transport.